Hey guys, Happy Monday!! I hope you’re all having a great start to your week! You might’ve seen on my Instagram that we are in NYC right now and loving every second of it! Here’s a look at an outfit that would be perfect to wear this fall. This ruffle cardigan and these booties are two of my favorites from the Nordstrom Anniversary Sale! Prices go up on August 6th so be sure to snag your favorites (and check back for restocked items!!!) before the items return to their original price. Happy (sale) shopping!!! Thanks so much for stopping by! I love pairing white and cream. That cardigan is so cute – is it soft? What a pretty outfit, Rach! I really love how the burgundy pops so beautifully against the white and cream palette, making it work so well for summer! That cardigan is so cute, I love the ruffle details on the back! Thanks for sharing and I hope you have a great week ahead! Such a pretty transition look for early fall! I love the whites with that bag. Have fun in NYC and safe travels! WOW! 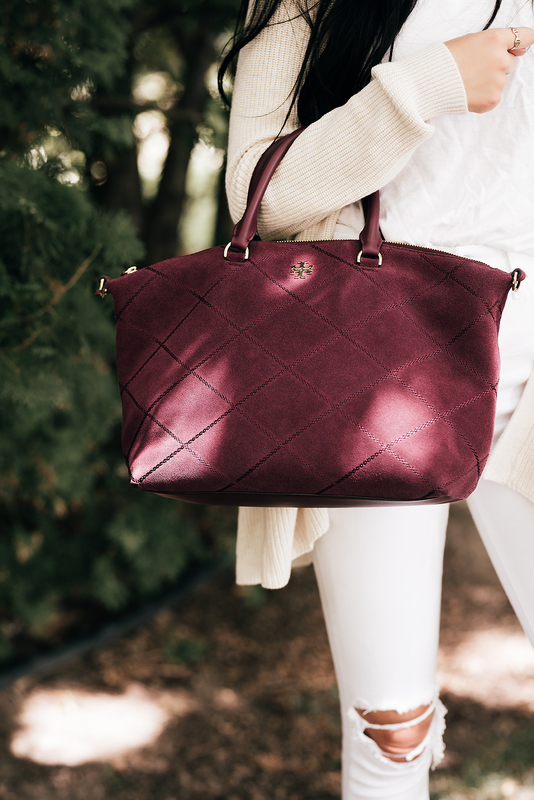 This wine color bag looks amazing with the whole outfit color! Love this look, especially the bag. this look is amazing! love the burgundy. Love the neutral color palette! Love that little pop of burgundy with that gorgeous bag!! Such a neutral outfit is always a great option for summer! As always I love your sunnies! I love those jeans Rachel! Love your burgundy tote and ripped jeans! You’re such a charmer in this casual combo! You’re making me visualize many comfy/elegant fall outfits to wear on my afternoon walks with my baby daughter! Soo pretty!! Love this look..
I’m in love with the quality of these shots! Oh this outfit is so perfect! I love the all white and the gorgeous wine colored bag, so pretty! You seriously can’t go wrong with a pair of white jeans! Yours looks great! Such a beautiful outfit and I’m so in love with the light color combo of the whole look! I love the all white look with the pop of oxblood! I am obsessing over this neutral outfit! So cute! Love the way you styled this outfit! I never really thought of wearing neutrals in summer but this is way too cute to pass up.